There’s been a chill in the air….right on cue. I’m reaching for my sweaters and have unpacked my turtlenecks in anticipation of cooler days. One of my favorite things to do is give a little nod outside my home that we are in a different season. How about a path of pumpkins? A few gourds tucked into the window boxes? 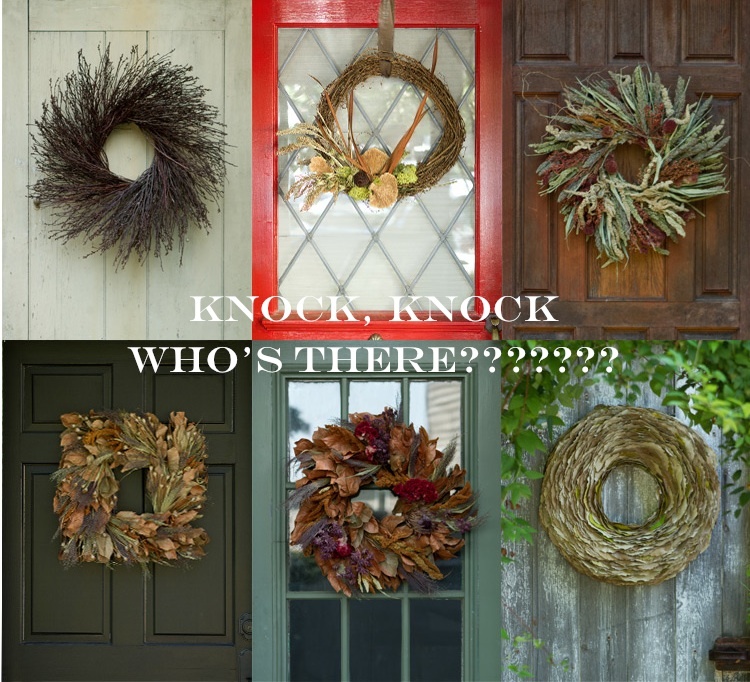 Maybe an autumnal wreath on the front door? Whatever the decor, it’s time to welcome Fall! Wishing you hot apple cider, hay rides and piles of amber colored leaves! How will you welcome fall? I have to admit I prefer warmer weather, but the colours that Mother Nature spins in Autumn help keep me warm. And pumpkins add such whimsy to fall decor – I can't resist them. 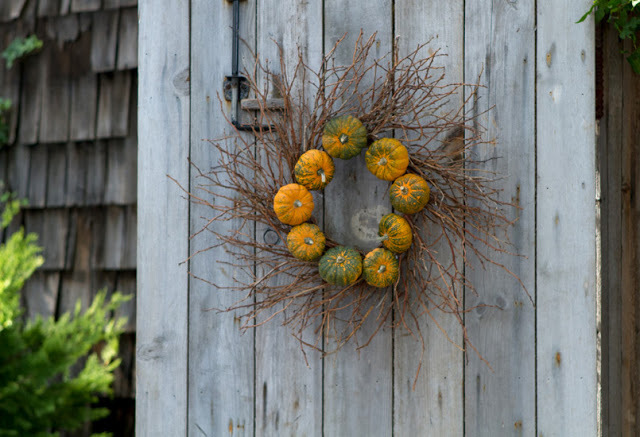 The little pumpkin wreath is great! Fall has put her foot down. After weeks and weeks of warm sunny skies, today is gray and drizzly. So I'll be brightening my day with thinking about how I can spruce my house up for fall. Great ideas here. 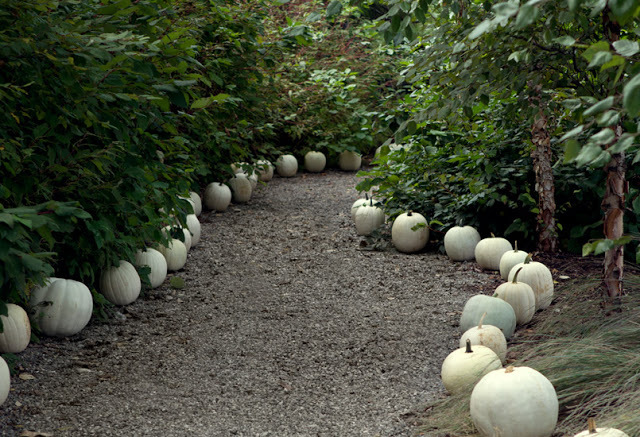 Love the pumpkin path! 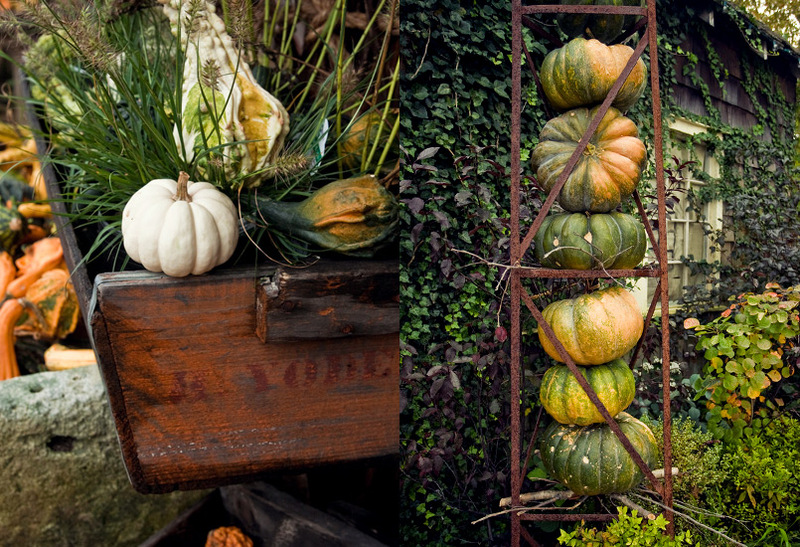 Joni over at Cote de Texas is having a wonderful give-away of the prettiest velvet pumpkins. I am thinking I might go for an all white pumpkin parade up my steps and some twiggy sort of wreath sprayed white. I too am getting excited for Fall and all that goes with. I'll be searching for white pumpkins very soon. Fall must be so beautiful where you are. We have some color in DC, but not like up north. Have a great weekend. ohh, those white pumpkins have me swooning. they're my favorites. As much as I hate to give up summer, I have to admit fall has come in beautifully around here. Some lovely ideas here! Happy Fall! Love that first image and wonder if the deer would have a serious game of soccer with all those pumpkins in the yard! And we know where the last image came from… Terrain would be a perfect spot to do some fall shopping. Have a wonderful weekend, Elizabeth. I'm loving Fall this year! The air is so fresh. Enjoy your weekend! I'll join my gorgeous friends Patricia and Loi with the white pumpkin theme for the front of house. They do seem to be a little thin on the ground in the UK at the moment but I am sure within a matter of a week they will begin to appear. Happy fall!! Is still warm down here in the south, but there is a slight chill at night and the morning. Have a great weekend Elizabeth! And today certainly has a fall chill in the air. My favorite time of year! Lovely lovely garden decors for fall!